From the famous Karachi Bakery in Hyderabad comes one of their most famous snacks, Fruit Biscuits. 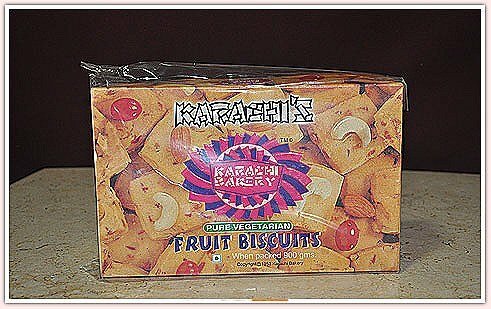 These biscuits are slightly sweet and have fruit flavored chewy pieces and cashew pieces. A unique biscuit that is excellent with tea and coffee. Ingredients: wheat flour, sugar, vegetable shortening, milk, salt, flavors, cashews and papaya preserve. This is a big, 1 lb package! If you have any questions about this product by Karachi's Bakery, contact us by completing and submitting the form below. If you are looking for a specif part number, please include it with your message.